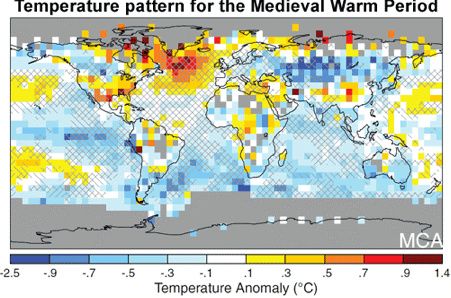 If you think it’s warm now, look back at the Medieval Warm Period. The so-called Medieval Warm Period was actually cooler than it is today under man-made climate change. The Medieval Warm Period spanned 950 to 1250 A.D. and corresponded with warmer temperatures in certain regions. During this time, ice-free seas allowed the Vikings to colonize Greenland. North America experienced prolonged droughts. Just how hot was the Medieval Warm Period? Was the globe warmer than now? To answer this question, one needs to look beyond warming in a few regions and view temperatures on a global scale. Prior temperature reconstructions tend to focus on the global average (or sometimes hemispheric average). To answer the question of the Medieval Warm Period, more than 1000 tree-ring, ice core, coral, sediment and other assorted proxy records spanning both hemispheres were used to construct a global map of temperature change over the past 1500 years (Figure 1). The Medieval Warm Period saw warm conditions over a large part of the North Atlantic, Southern Greenland, the Eurasian Arctic, and parts of North America. In these regions, temperature appears to be warmer than the 1961–1990 baseline. In some areas, temperatures were even as warm as today. However, certain regions such as central Eurasia, northwestern North America, and the tropical Pacific are substantially cooler compared to the 1961 to 1990 average. Figure 1: Reconstructed surface temperature anomaly for the Medieval Warm Period (950 to 1250 A.D.), relative to the 1961–1990 reference period. Gray areas indicate regions where adequate temperature data are unavailable. From Michael E. Mann et al., “Global signatures and dynamical origins of the Little Ice Age and Medieval Climate Anomaly,” Science 326, no. 5957 (November 27, 2009): 1256-1260, Figure 2a. Reprinted with permission from AAAS. How does the Medieval Warm Period compare to current conditions? 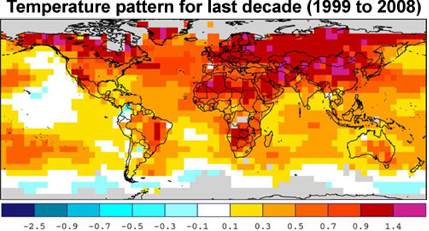 Figure 2 is the temperature pattern for the last decade (1999 to 2008). What we see is widespread warming (with a few exceptions such as regional East Antarctic cooling). Figure 2: Surface temperature anomaly for period 1999 to 2008, relative to the 1961– 1990 reference period. Gray areas indicate regions where adequate temperature data are unavailable. Source: NOAA. The Medieval Warm Period was not a global phenomenon. Warmer conditions were concentrated in certain regions. Some regions were even colder than during the Little Ice Age. To claim the Medieval Warm Period was warmer than today is to narrowly focus on a few regions that showed unusual warmth. However, when we look at the broader picture, we see that the Medieval Warm Period was a regional phenomenon with other regions showing strong cooling. 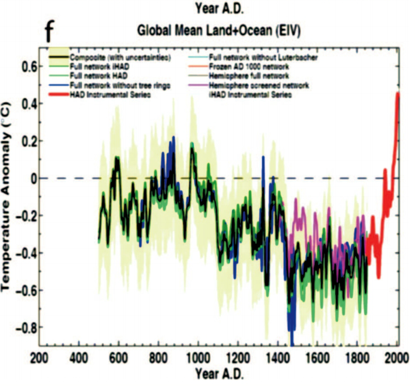 What is more (and as can be seen in Figure 3): Globally, temperatures during the Medieval period were less than today.